A Good Science Lesson With PowerPoint? An example of how a science lesson with powerpoint can help. 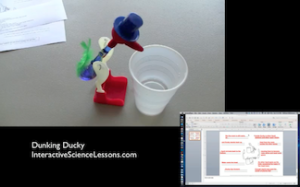 This fun lesson is called “Dunking Duckies”. What makes a science powerpoint good? It is magic? Well, yes. That means there’s no hope for you. Too bad. A good PowerPoint is quiet. A quiet powerpoint stays focused on just one idea and doesn’t get sidetracked with extra thoughts or features. Those just confuse and distract your science lesson. You want your science powerpoint to go in a straight line from beginning to end without taking any turns in between. A good PowerPoint meets kids where they’re at. Because we’re so familiar with our content we can forget how intimidating and confusing it can be to learn something for the first time. The good powerpoint starts at absolute zero, stating things we assume everyone knows, which builds everyone’s confidence. Then it adds in enough info on each slide to challenge your students just a bit. Those two qualities of good science lesson PowerPoints- being quiet, and meeting kids where they’re at- are what distinguish most of the Powerpoints on this site. Check out some below for free.